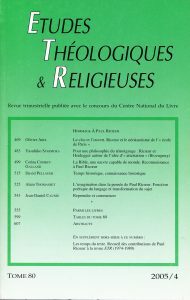 C’est au nom d’une philosophie consciente de ses propres limites que Paul Ricoeur établit une tension dialectique entre théologie et philosophie. Pas plus que le théologien, le philosophe ne peut penser à partir de lui-même, dans l’illusion d’un commencement absolu, mais il se trouve toujours déjà pris dans une pensée qui le précède. À partir de ces réflexions sur la notion de limite, Jean-Daniel Causse reprend la thématique, centrale chez Ricoeur, d’un mal et d’une espérance en excès du savoir. Il analyse ensuite la compréhension du langage chez Ricoeur comme production infinie du sens avant d’en proposer une relecture critique à partir d’une conception du réel comme interruption du sens et comme ouverture d’un monde de la signification. Acknowledging the awareness philosophy has of its own limits, Paul Ricoeur establishes a dialectical tension between theology and philosophy. No more than the theologian can the philosopher develop his thought by starting from himself, with the illusion of an absolute beginning ; he is always driven into a thinking that precedes him. On the basis of such reflections about the idea of limits, Jean-Daniel Causse carries on with the topic of evil and hope as they are in excess of knowledge – a topic which is central in Ricoeur’s thought. Then he analyses Ricoeur’s understanding of language as an infinite production of sense before proposing a critical rereading based on a conception of the real as interruption of sense and opening of a world ofmeaning.